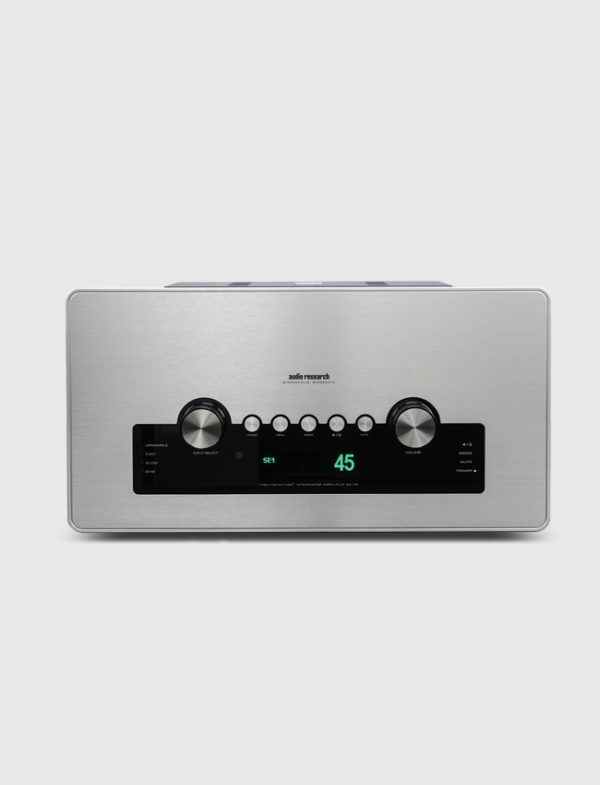 A preamplifier, amplifier, phono stage, and digital to analog converter all in one chassis, the GSi75 combines with your favorite speaker to deliver a singular and simple solution to control your listening system. Unlike other integrated designs that make performance – sacrificing compromises to fulfill a price point or form factor, the GSi75 harnesses the power and technologies developed by Audio Research into an authoritative platform to reveal the performances in your media. Powered with the new KT150 output tube, the GSi75 supplies finesse and control that belies the 75-watt per channel power rating. The digital-to-analog converter will handle almost any sampling frequency including DSD. The phono stage and headphone amplifier round out the GSi75, providing total system control and integration. The elegant, understated industrial design will complement the rest of your system both visually and sonically. POWER OUTPUT 75 watts per channel continuous from 20Hz to 20kHz. 1 kHz total harmonic distortion typically 1.5% at 75 watts, .05% at 1 watt. Approximate actual power available at “clipping” 80 watts (1kHz). (Note that actual power output is dependent upon both line voltage and “condition” i.e. : if power line has high distortion, maximum power will be affected adversely, although from a listening standpoint this is not very critical. 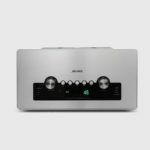 )POWER BANDWIDTH (-3dB points) 12Hz to 70kHz.FREQUENCY RESPONSE (-3dB points at 1 watt) 1.0Hz to 70 kHz.INPUT SENSITIVITY 0.55V RMS Single-ended for rated output. (32.5dB gain into 8 ohms.) INPUT IMPEDANCE 52.5K ohms Single-ended. INPUTS SE1, SE2, SE3, Phono, S/PDIF digital (coax RCA and Toslink), USB MAXIMUM INPUT 10V RMS (any input). OUTPUT POLARITY Non-Inverting (any input). OUTPUT TAPS 8 ohms, 4 ohms. OUTPUT REGULATION Approximately 2dB 8 ohm load to open circuit (Damping factor approximately 4). OVERALL NEGATIVE FEEDBACK 4dB. SLEW RATE 10 volts/microsecond.RISE TIME 4 microseconds.HUM & NOISE Less than 1.0 mV RMS -88dB below rated output (IHF weighted, Vol down).CONTROLS Rotary volume (103 steps), Rotary input selector, Power, Mute, Bias. DIGITAL SAMPLE RATES 44.1kHz to 192kHz, SPDIF and USB 2.0 HS, DSD USB 2.0 HS MASTER OSCILLATOR 22.579mHz ±20Hz for 44.1, 88.2 & 176.4kHz. 24.576mHz ±20Hz for 48, 96 & 192kHz sample rates. INTRINSIC JITTER <10ps POWER SUPPLIES Electronically regulated Low and High voltage supplies for input stages. Automatic 40 sec. warm-up/brown-out mute. POWER SUPPLY ENERGY STORAGE Approximately 350 joules. POWER REQUIREMENTS100-125VAC 60Hz (200-250VAC 50Hz) 400 watts at rated output, 600 watts maximum, 210 watts at “idle’: 1.0 watt power off. TUBES REQUIRED 2-Matched pair KT150-Power Output; 2 -6H30 driver.